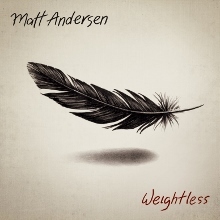 If, as he sings so soulfully on the opening track of his new album Weightless (True North Records), Canadian singer and guitarist Matt Andersen has indeed lost his way, you wouldn’t be able to tell it by this project, which finds Andersen sounding just as impressive and on track as ever. Something of a mash-up of Joe Cocker, Marc Cohn, The Black Crowes, and Darius Rucker, with music that exhibits all the freedom and airiness of, say, the Tedeschi Trucks Band, Andersen is one of the best acts you may have yet to hear, something you’ll do well to rectify just as soon as you can. Andersen’s debut on the True North label, Weightless is as uplifting and flowing as its title, starting on the creeping, soulful grooves of “I Lost My Way” with punchy horns and Robert Randolph-like pedal steel from Paul Rigby. That’s just the first of several highly infectious songs you’ll find here, along with the funky rhythms of the horn-laced title track, including such lyrics as “standing lost, but standing tall/ not afraid of the costs, afraid of the fall” just as Mike Stevens bursts in with a terrific harmonica solo, and the catchy rockabilly sounds of “City of Dreams”. Once again, Andersen proves just as capable with the soft stuff, presenting such ballads as the peaceful “Let’s Go to Bed” about leaving the day’s troubles behind you, the quietly powerful “Drift Away”, the slow country sounds of “So Easy”, and a serene “Between the Lines”. In between, you’ll find the passionate vocals and inspired lyrics of songs like the swaying “My Last Day” – one of several tracks to include superb female backing vocals from Amy Helm and Alanna Stuart, a Jackson Browne-sounding “Alberta Gold” with its Buddy Holly-like opening riffs, the breezy “Let You Down”, a gritty, heavy “The Fight” featuring Los Lobos’ Steve Berlin (who also produced the album) on piano, and the grooving, thought-provoking closer “What Will You Leave”, again offering some nice backing vocals and horns. What Andersen leaves, of course, is another terrific collection of songs that, along with his earlier works, proves that Andersen deserves to be “found” by a whole new group of fans. This entry was posted in Albums and tagged Matt Andersen, Steve Berlin. Bookmark the permalink.